Why search the tool box when you can just reach into your pocket? 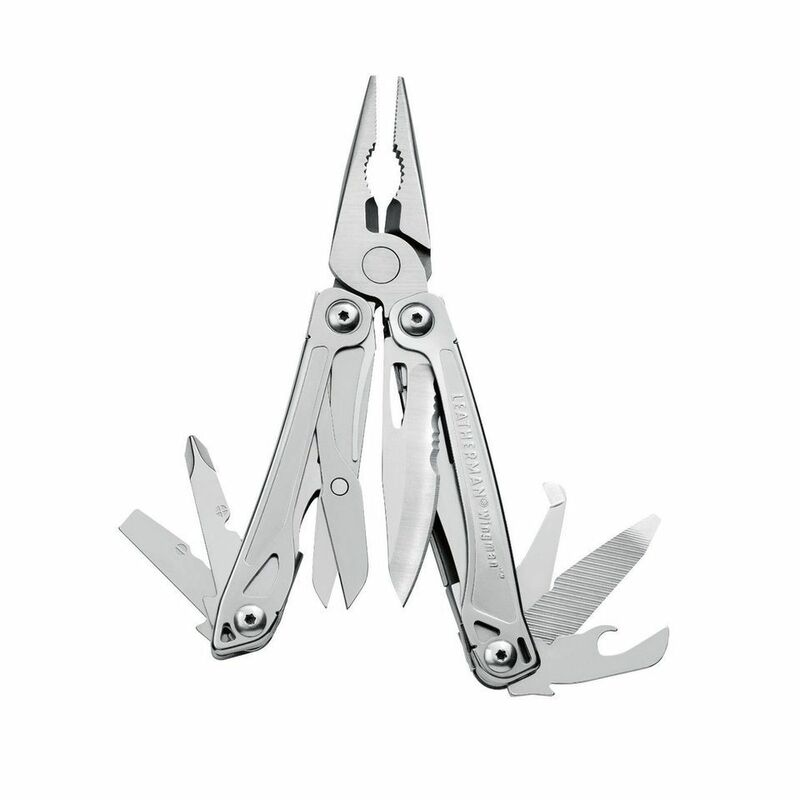 The Leatherman Wingman Multi Tool features 14 tools in one small package, including two pairs of pliers, a combo knife, wire strippers, three screw drivers, scissors, and more. The Wingman is made of durable stainless steel and weighs only 7 ounces, so it can put up with a lot of abuse and go just about anywhere. It can also be opened with one hand—a must for the multitasker—and is backed by a 25-year warranty. A Dremmel is one of the most versatile tool-box staples around, and for good reason: It can cut, carve, engrave, grind, sharpen, clean, polish, sand—you name it. The two-speed 7700 comes with 15 accessories to accomplish all those tasks. It’s also cordless, with a rechargeable battery that only needs a few hours for a full charge. If you’re always tinkering in the garage, the 7700 can also be purchased with an automotive kit that features 10 car-friendly accessories. Becoming a homeowner can be an intimidating prospect, but The Family Handyman Complete Do-It-Yourself Manual is a book that can soothe any newbie’s nerves. Whether you don’t know the difference between a Phillips head and flathead screwdriver, you need to know how to shut off your utilities in case of an emergency, or have no idea how to tackle a common issue like fixing a broken tile or switching out a faucet, this book has the answers. There are also more than 3,000 photos and illustrations to guide you through common issues and fixes. When it’s time to upgrade from stuffing hammers and screwdrivers into your pockets, the Occidental Leather 5500 Electrician’s Tool Pouch offers a whopping 15 compartments to keep must-haves handy. It includes a hammer holder, flashlight loop, and tape chain, and the whole pouch is curved to fit comfortably around the hip. The thick, tough leather is engineered to withstand a lot of day-to-day wear and tear, too. Some projects need a little more light, but holding a flashlight means you’re left with just one free hand. A good headlamp like the 200-lumen Black Diamond Spot is the answer. The main LED light is dimmable with one tap, and the light is waterproof if you find yourself working in wet conditions. There’s also a red night-vision mode and a strobe for situations where others need to see you, too. A measuring tape might work for small jobs, but the Bosch GLM 35 Laser Measure provides a faster, more accurate way to measure up to 120 feet. But it doesn’t stop at distance—the laser has functions for area, length, volume, continuous measurement, and addition and subtraction, too. One touch turns it on, and there’s a backlight if you’re working in dim areas. The Bosch GLM 35 is also small enough to stuff in your pocket. Chalk paint has become a popular way for DIY enthusiasts to quickly, easily restore tired furniture or cabinets—it sticks to surfaces that haven’t been sanded or primed, and looks great in the end. The Renaissance Chalk Furniture Paint Deluxe Starter Kit gives chalk-paint novices everything they need for their first job: three brushes, two cans of finishing wax, and a quart of paint in one of more than 40 colors. The paint is non-toxic, dries in 20 minutes, and doesn’t give off the overpowering fumes of normal paint either. Hauling the iPad around for tutorials on that latest DIY project? The New Trent Gladius case can give it the protection it needs, no matter how precarious a position your tablet ends up in. Like many shock-proof cases, it offers dual-layer protection that combines a hard clamshell and soft rubber to cushion drops. There’s also a built-in screen protector and a kickstand that rotates 360 degrees to accommodate any viewing angle. If that’s not enough, an adjustable leather strap can help you keep a good grip on your iPad even when you’re on the go. This one is definitely a splurge, but what better way to stretch your budget than with a device that saves money in the long run? The Nest Learning Thermostat is ideal for any connected soul—or just a lazy one who doesn’t want to get out of bed—because it can be controlled remotely from phones and tablets. But it also self-programs, figuring out what temperatures you like and at what times, and senses when you’re gone to automatically turn down the temperature and save energy. The sleek round case and high-resolution color display are also a major aesthetic upgrade from most thermostats. Perfect for that first-time homeowner, the Stanley 65-Piece Homeowner’s Tool Kit has all the must-haves including a hammer, measuring tape, pliers, utility knife, box cutter, hex wrenches, level, and much more. It also comes with a set of 10 non-slip screwdrivers and a 6-inch adjustable wrench. No need for a tool box, either, since everything comes secured in a blow-molded plastic case. Interested in reading more reviews? Take a look at our selection of the best home tool kits. Perfect for the restless interior decorator who’s always finding new art, the GoodHangups Instant Magnetic Gallery allows for quick transformations without putting even more holes in the walls. Adhesive magnetic stickers go directly on the wall, and a strong magnet goes over prints, posters or anything relatively lightweight to hold them fast—no hammers and nails required. The set comes with 40 reusable magnetic wall stickers and 40 magnets, and will work on practically any surface including brick, concrete, wood, and textured walls. And the magnetic stickers are removable when you decide to rearrange your gallery wall. Many home décor addicts love the reclaimed wood trend, but covering a wall with it is expensive and time-consuming. With NuWallpaper, getting the look is as easy as smoothing a giant sticker onto the wall. It’s removable, repositionable, and won’t leave unsightly sticky residue once it’s taken down. Rolls of NuWallpaper are 20.5 inches by 18 feet, and they come in all sorts of patterns including damask, stripes, chevron, and brick—in case reclaimed wood isn’t your thing. A great splurge gift for handy homeowners with limited space, the Little Giant 17-foot Revolution Multi-Use Ladder has several functions in one: extendable A-frame ladder, staircase ladder, extension ladder, 90-degree ladder, scaffold system, and more—there are up to 24 configurations. Rated to hold up to 300 pounds, the Revolution XE ladder has wide rungs, wide-flared legs and deep treads that increase stability and traction. Tip and glide wheels allow for easy transport, and it folds compactly for storage with just a 8-inch-wide profile. Interested in reading more reviews? Take a look at our selection of the best ladders.